We’ve been watching the Winter Olympics quite a bit. P watches about 5 minutes of whatever I have on and then walks away. 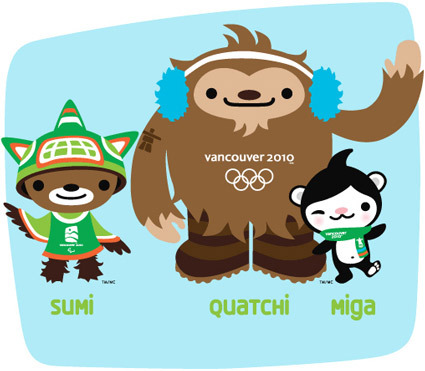 She does love the mascots: Sumi, Quatchi and Miga. Their videos she could watch over and over. I have to be honest. I’m already starting to have visions of P, in her teens, reaching her potential in a sport. I can’t help it. My whole life I had visions of me wining Wimbledon. Now, I see in P a better version of me, and I think if she finds passion in a sport she could go very far. Already I see the ingredients of a professional athlete in her. She’s focused and determined. She’s is fast, strong and has great agility. She has great body awareness and feel. She is confident. And my least favorite trait at the moment: she is defiant. This year there seems to be much focus on the parents of the athletes. I’m not sure if it’s because I am a parent now and am more aware of it or if a parents role is now in the spot light. Shaun White talked about his parents sacrifices and constant support. Apolo Ono talked about how pivotal his father was in getting him to where he is. Alpine skiing gold medal winner, Aksel Svindal also credits the constant support of his single father for his achievements. I don’t want to do to P what my father did to me. I think I’m steering clear of his mistakes. I do know that when I have visions of P reaching the pinnacle of her potential I feel joyful not because she would win something but for another reason entirely. Nothing in the world beats the feeling that comes when you have trained yourself to do something to perfection and then to be able to execute it under high pressure and better than anyone else in the world. I would love nothing more for P to experience that kind of adrenaline rush and that sense of accomplishment. For that I would sacrifice the world for her.